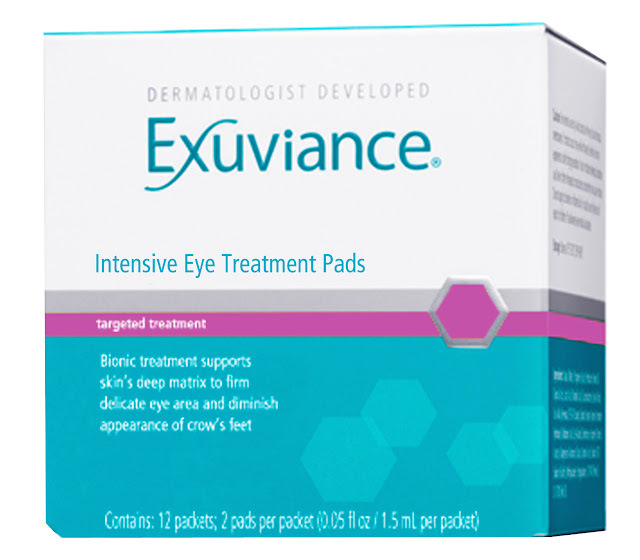 Exuviance recently sent me a box of Intensive Eye Treatment Pads to try, and share the results with you all. Below you will find a product description provided by the company, as well as my experience with the product and my honest opinion of it. These eye pads are a great addition to your eye treatments, plus they give you an excuse to take 20 minutes to treat yourself! Exuviance® Intensive Eye Treatment Pads firms and hydrate the eye area while stimulating cell renewal and minimizing fine lines and wrinkles with Lactobionic Acid and Pro-Vitamins A, C and E.
• We recommend following up with an application Exuviance Hydrating Eye Cream. These pads are a great pick-me-up for your eyes. They're hydrating, cooling, and smooth out my under-eye area and make me look more awake. They smell slightly of citrus and are very easy to apply and relax with them on. With regular use, I've noticed an overall smoother and brighter under-eye area. I'm very pleased with this product, it really does work!